Создание ярлыков SMS и вызовов в несколько шагов. Create SMS and Call shortcut files with just a few steps. Manually creating shortcut files for sms and call sending to specific contacts requires using a text editor (in PPC and PC) and then manually typing text codes and memorizing the phone number for that particular contact, then repeating the same procedure again and again for each contact. I've created this simple application to automate all of this. I hope it will also be useful to other people. 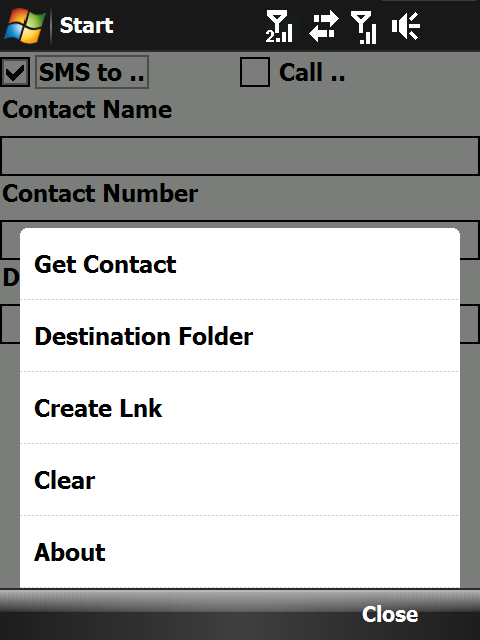 The shortcut files created will allow you to automatically create a new sms for a particular person, or make a call to a person, depending on what lnk file you chose to create.